Re: 1972 Road Runner V code cars. Not long ago there was a 1972 Plymouth B-body being advertised for sale in the $65k price range. Was that the above Larry's car, or was it a different car? So Larrys car is the retored one I found elsewhere in my searches. Good to know. 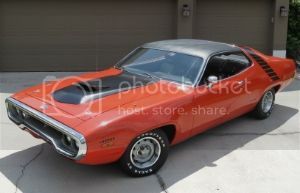 Anyone know who owns the other project 1972 Plymouth V code? Looked very similar to Larrys car before the restoration. I remember it looking orange, but it very well could have been red. Was probably about 8 months or so ago. The second car you saw was most likely Larry's car also. There are rumors of a couple more 72 V-code RRs, but none have been made public. Then, of course there is the Red long lead press car - which Steve has posted already. Typically these long lead pre-production cars are dismantled and don't get sold to the public. It has not surfaced either. It very well could have been Scott, but did Larry have his car listed on eBay within the last year or so in project form for $65k?!? ...or ever even? I can't imagine it could have underwent a full restoration that quickly. Scroll down and you will see before pics posted in February 2015. Darn the people with ambition and money....Hahaha. Lately I was thinking of making a pretty serious offer on the car if it was still hanging around, however I do not have enough cars to sell/trade nor the want to own a restored car. I will definitely read through/glance at the restoration the very next free moment I have though. These cars absolutely fascinate me. There were 7 V-code cars built in 1972, plus the red long-lead press car that is in this thread. Five of these cars are known to exist, 3 Charger Rallyes and 2 RR-GTXs - so there are 2 V-code cars unaccounted for. WH23V2G100006 - Charger Rallye - Red pilot car - currently undergoing a lengthy restoration. WH23V2G100075 - Charger Rallye - Yellow car in Michigan - forever unrestored. RM23V2G105346 - RR GTX - Larry's old car - Just restored and debuted at the 2015 MCACN. WH23V2A130510 - Charger Rallye - hemi orange 4 speed! - car was stolen and has not been recovered. Supposedly there was a B5 blue car that roamed the suburbs of Detroit in the 70s. Another Petty Blue/Black/Black car roamed the streets of Wichita, Kansas in the 70s. Both these legends have excellent eye-witness accounts, but no proof available. Thanks for the additional info Eric! Sure would like to see all 7 cars plus the pilot car survive! Scott.